I've just enjoyed myself of being in better condition yesterday before another bad thing happens: I got measles (Indonesian, cacar air / campak). Measles is an infection of the respiratory system caused by a virus, specifically a paramyxovirus of the genus Morbillivirus. Morbilliviruses, like other paramyxoviruses, are enveloped, single-stranded, negative-sense RNA viruses. Symptoms include fever, cough, runny nose, red eyes and a generalized, maculopapular, erythematous rash. 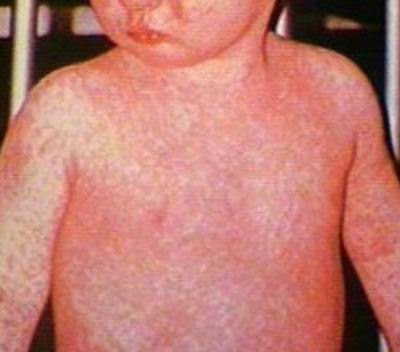 Measles is a highly contagious viral disease, which affects mostly children. It is transmitted via droplets from the nose, mouth or throat of infected persons. Initial symptoms, which usually appear 8–12 days after infection, include high fever, runny nose, bloodshot eyes, and tiny white spots on the inside of the mouth. Several days later, a rash develops, starting on the face and upper neck and gradually spreading downwards. There is no specific treatment for measles and most people recover within 2–3 weeks. However, particularly in malnourished children and people with reduced immunity, measles can cause serious complications, including blindness, encephalitis, severe diarrhoea, ear infection and pneumonia. Measles can be prevented by immunization. Actually, I am scheduled to get anti-measles vaccination / immunization next week. However, the virus is coming earlier than expected. I hope I can be well soon enough. The hot I feel is so distracting so much so that I can't enjoy drinking my baby formula. The following picture is not my photo. It's taken from somewhere else. My measles is not as bad as that. Only around the neck.